Why do cats attack, and how can you tell if a cat is about to bite or scratch before it happens? Here’s what to know about handling a cat attack. Most of us see our cats as our adorable little furry friends. The idea that they could be dangerous to people seems laughable. But, for anyone who has endured a cat attack, the threat of bodily harm from a cat is real. While most cat guardians will never encounter an attacking cat, there are others who will. It’s important for every pet parent to know why cats attack, how to avoid it, and what to do if you are attacked by a cat. By exploring the anatomy of a cat attack, you can minimize the damage by modifying cat aggression before it leads to injury! Why do cats attack? Photography ©cynoclub | Thinkstock. Reacting to a perceived threat. Are you going to hurt me? Territory. Their domain is crucial to their survival ­­— so intruders beware. Fearful that someone is taking their food away. Cats who have had to fight for survival can be plagued with the anxiety of being without sustenance. Redirected aggression. Your cat sees another cat outside the window and because he can’t attack that cat, he attacks you. 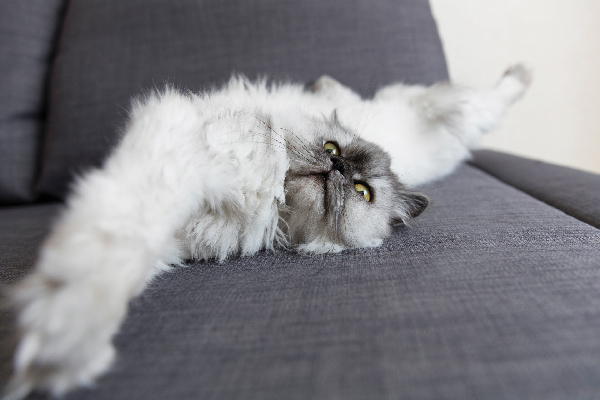 What is your cat’s body language telling you? Interpreting a cat’s body language is the best way to determine next steps. 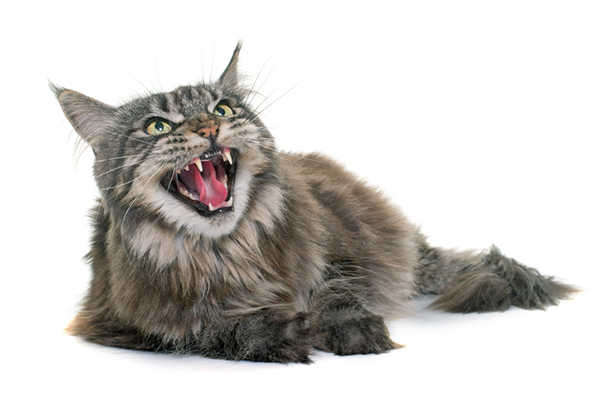 When it comes to cat attacks, an ounce of prevention is worth many tons of cure! Baldridge recommends distraction as one of the best methods to avoid a cat attack. “Using a cat toy can usually alter a cat’s demeanor. He will go from focusing on the perceived threat and focus on the toy instead.” Play therapy is a great way to help diffuse the situation. Another helpful tip is to back off of an agitated cat. Widening the cat’s personal space can alleviate his anxiety and prevent a cat attack. It is critical to not close in on, or try to touch, a cat who is displaying any signs of aggression. Also, fixing your cat can go a long way toward quelling aggression. 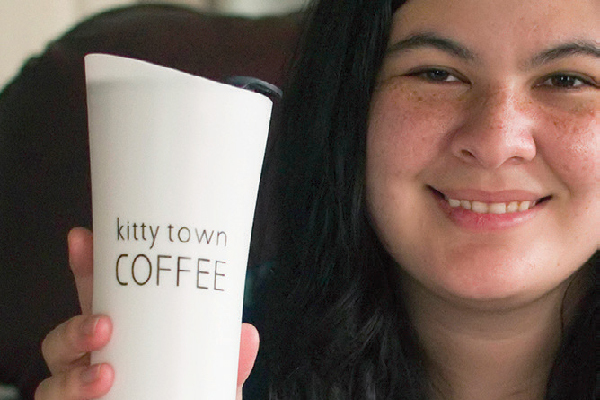 It takes a multi-pronged approach to live more peaceably with a cat who is prone to attack. Making a list of all the triggers that lead up to a cat attack is a good first step. Include as many details as possible whenever there’s an attack. Listing the triggers makes it easier to manage unwanted behavior. Don’t push your cat’s buttons. If he doesn’t like belly rubs, don’t rub his belly! Be mindful of the things he doesn’t like, and don’t do them. Take a holistic approach to his environment. High cat trees, tunnels and window perches are great in giving your cat plenty of places to hide and seek! Remember, cats in the wild would spend their days hunting, playing and looking for a mate. Boredom leads to frustration, and frustration leads to attacks. There are also calming tinctures that help. 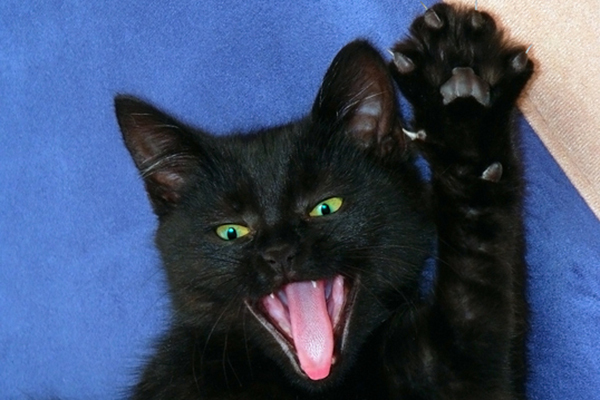 Pheromone products, like Feliway sprays, can change your cat’s demeanor. There’s also Bach’s Rescue Remedy, which you can add to his water. A lot of aggression is born out of fear — so only use positive reinforcement when training a cat. And of course, if the situation is escalating, contact a feline behaviorist. Treating cat bites is a bit more serious than treating cat scratches. Photography ©DjelicS | Thinkstock. The first thing to do if you’re attacked by a cat is not to panic. “Wash the wound thoroughly with antiseptic,” Baldridge recommends. 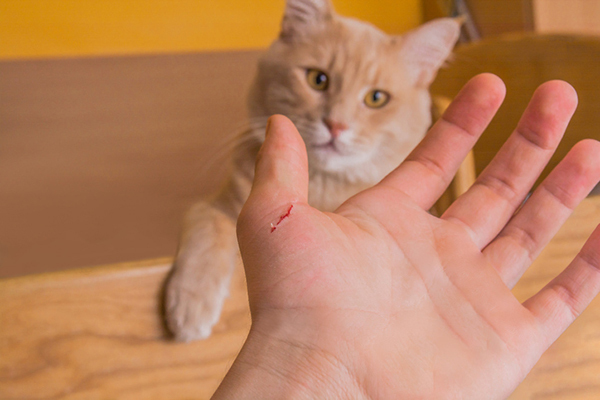 “Scratches are less worrisome, but cat bites need to be carefully examined.” If your wound isn’t profusely bleeding, keeping it clean should be sufficient. But, if it’s not starting to heal after 24 hours, a trip to the doctor or hospital is best. “Use your own judgment, but don’t ignore any warning signs.” Treating cat bites is a serious matter. Working on the right solution with patience and perseverance for a cat who attacks can prevent cat attacks before they happen and ensure a happier cat! Thumbnail: Photography ©Robert Redelowski | Thinkstock. I have an almost 4 year old male cat that is indoor and has been the only cat ever since i got him and recently a friend gave me a new male cat that is 9 months old. My older cat wouldn’t stop hissing at him even after slowing introducing them to each other. Sometimes he would become so aggressive it even scares me because he might scratch me too. I had my older cat neutered because i thought it might lessen his aggression but a week later after the surgery he still has the same reaction towards the new cat. What should I do to help my older cat adjust to the new cat? Will it help if i put him in a cage and have the new cat roam around? We suggest asking a vet or behaviorist for the best advice in this situation. These articles might help, too. We don’t suggest putting one of the cats in a cage. I just give the kitties kisses until they stop biting me.